Services for Ted Kneebone, 84, of Aberdeen, SD, will be 1:00pm, Monday, January 21, 2019 at Faith United Methodist Church, Aberdeen, with Pastor Jack Erickson and Father Richard Zephier officiating. Burial at Riverside Cemetery, Aberdeen. Ted passed away Thursday, January 17, 2019 at Avera St. Luke’s Hospital in Aberdeen, SD. Visitation will be 2 hours prior to the service at the church. Theodore Ramsey Kneebone was born April 21, 1934 to Earl and Marion (Lodge) Kneebone at Lake Andes, SD. The family later relocated with Ted graduating from high school at Sisseton, SD in 1952. He was united in marriage to Jo Dobberpuhl in 1954 at Aberdeen SD. Ted earned his BS in Education at Northern State University, and followed with his Masters in Library Science from the University of Minnesota. He continued with his education throughout his lifetime completing several post-grad courses in teaching the blind and visually impaired at NSU and Northern Colorado University. 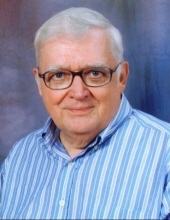 He pursued his passion for writing, reading and education, being employed at a wealth of various schools, libraries and universities in South Dakota, Minnesota, Nebraska and Illinois from 1957-1980. He went on to become librarian, classroom teacher, drama coach, newspaper editor and photographer for the SD School for the Blind and Visually Impaired from 1980-1998. He was a member of Faith United Methodist Church where he wrote and directed several radio plays, he also held various membership with state education, library, and transportation organizations. He published several articles, journals and reports for various library science, state planning agencies, as well as speech writing and research for SD state governors and legislation. Ted was a candidate for SD state senate in 2004, and the State House in 2006. He never tired in seeking to better his state and community. Ted was instrumental in bringing the Rideline service to Aberdeen, filling a much-needed void in transportation. Ted continued until his passing advocating for further transportation needs in the area as an appointee of the National Association of Railroad Passengers council, focused on bring passenger train service back to the Hub City. Ted enjoyed reading, writing, photography, collecting music and old-time radio, but most of all, Ted dearly loved his children and grandchildren. They always came first in his life. Ted was grateful for the love and support of his many caretakers over the years. Grateful for having shared Ted’ life are his children: Todd Kneebone, Minneapolis MN, Nancy Kneebone, Peoria AZ, grandsons: Seth Kneebone, Zachary Amundson, Brandon Flicek, and brother: Robert Kneebone, Long Beach CA. Preceding Ted in death are his parents: Earl & Marion Kneebone, and sister: Elizabeth Criddle. To send flowers or a remembrance gift to the family of Ted R. Kneebone, please visit our Tribute Store. "Email Address" would like to share the life celebration of Ted R. Kneebone. Click on the "link" to go to share a favorite memory or leave a condolence message for the family.